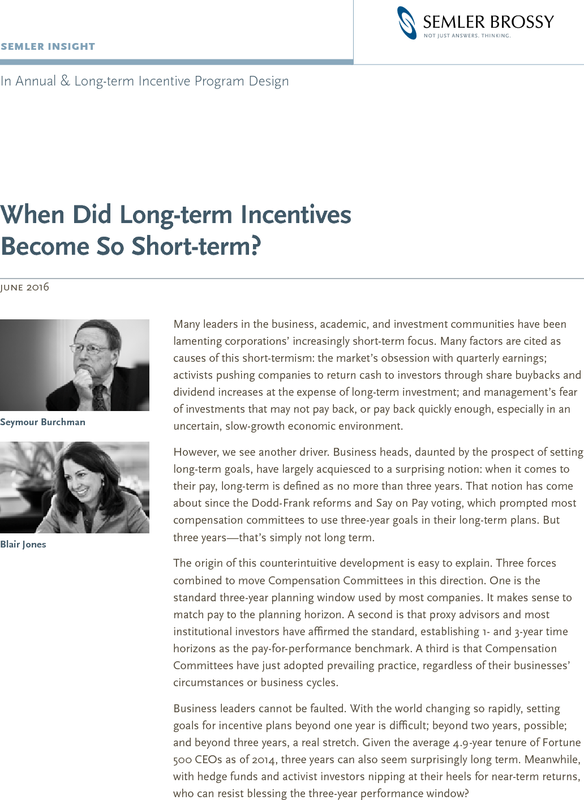 When Did Long-term Incentives Become So Short-term? Many leaders in the business, academic, and investment communities have been lamenting corporations’ increasingly short-term focus. Many factors are cited as causes of this short-termism: the market’s obsession with quarterly earnings; activists pushing companies to return cash to investors through share buybacks and dividend increases at the expense of long-term investment; and management’s fear of investments that may not pay back, or pay back quickly enough, especially in an uncertain, slow-growth economic environment. However, we see another driver. Business heads, daunted by the prospect of setting long-term goals, have largely acquiesced to a surprising notion: when it comes to their pay, long-term is defined as no more than three years. That notion has come about since the Dodd-Frank reforms and Say on Pay voting, which prompted most compensation committees to use three-year goals in their long-term plans. But three years—that’s simply not long term. Read the full article by downloading the PDF.